Aretha Franklin performs on the Madison Central stage during the Detroit Music Weekend in Detroit. A great American songbird, the beloved Aretha Franklin, has reportedly died at the age of 76 at her home in Detroit due to an advanced case of pancreatic cancer. 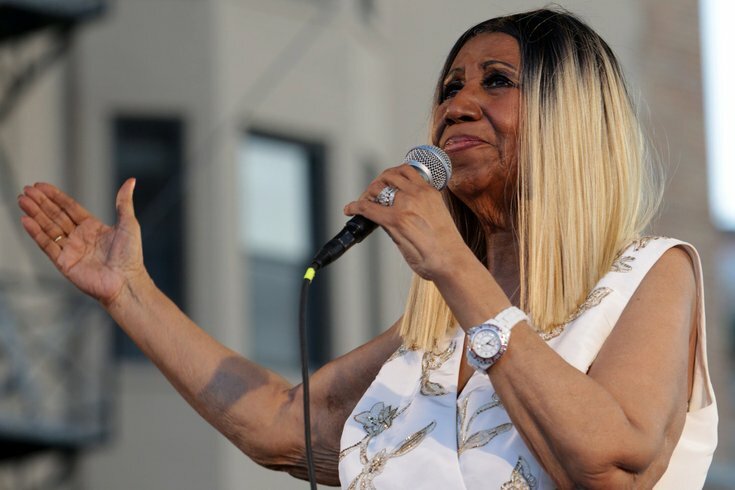 Franklin carries with her a legacy as one of America's greatest vocalists — in a genre, don't make a mistake — though she touts the title of "Queen of Soul," which she earned as a young artist forging her way into the industry in her early 20s. She started her career by bringing gospel songs to the mainstream charts and then eventually gave us songs that modeled a woman who was fierce, open-hearted and sensual. Her greatest hits, among many, include her go-to "Respect," "A Natural Woman" and "Chain of Fools." She's a 18-time Grammy Award winner. The first woman inducted into the Rock & Roll Hall of Fame. A recipient of the Presidential Medal of Freedom from George W. Bush in 2005. More than 100 singles on the Billboard charts and 75 million records sold in her lifetime. Franklin still remains one of the most decorated (and celebrated) musicians that has somehow managed to keep her raspy, voice-like-honey tunes in our headphones, decades after they topped charts.